After a surprise announcement yesterday that had the Lumia 521 ready for an April 27th launch on the Home Shopping Network, it’s gone live a bit early. As the below image indicates, orders are already processing with the requisite car charger and screen protector included for the $149.95 price tag. The Lumia 521 is powered by Windows Phone 8 and features a 4? display, 5 megapixel camera, 720p HD video and Nokia exclusive applications such as Nokia Music, Cinemagraph, Smart Shoot, HERE Drive, Maps and Transit. Early reviews have the Lumia 521 pegged as one of the best budget devices around, held back only by some of the limitations contained within the Windows Phone 8 app store. Still, that app store is filling up every day and we’re hopeful some future smartphone owners will find the budget price of the Lumia 521 enticing enough to try. I still have sticker shock, but in a good way. Best price for a smartphone! Get one as your main device, or a backup. You can’t go wrong with this one people. It has all the features of a device most people want. Mainly the SD card slot which takes a 64GB. Good job TMo and Nokia. Ya except for no flash on the camera otherwise I would get prob get one. Still surprised they tout the camera yet leave that off! That has become a must for me as I like to take pics when out in low light with friends etc. false. megapixels do not ensure quality. They don’t, but he is still correct. If only this phone had a flash. Then it would be a phenomenal deal. Flash should not be a deal breaker, lol. It’s only $149 shipped, you can’t find good deals like this all the time. Use a flashlight or turn the lights on lol. Ya but if your someone that likes to snap shots in nightclubs social events etc with friends they will not turn out w out this. Ill stick w my L9 . I wonder how much more it would really drive the cost up for them to have included that component..? Oh noes! How then will people see your drunk photos and know how awesome you are? HOW?! LMAO. Oh im not even gonna let that bother me. A flash is just a standard requirement for me on phone now as I like to take alot of pics using phone like most people do these days. :) No matter how good low light they put ya still need the flash in dark spots. Again what im just wondering is does that really drive the price up that much.. I wouldnt think so. Just surprised they wouldn’t include it. Thank you! I was like am I the only one puzzled by why they would leave that off. This is useless in low light indoor night shots etc. Have you received the jelly beans update on your l9 yet.? I haven’t i called customer services and they said we should have the update by Monday. It doesn’t need flash. Lumia series phones take better low-light shots with the flash off. Do a search on the web for Lumia 521 low-light conditions. I was thinking more along the lines of using it as a flashlight. I know Nokia’s phones are known for great low light capabilities. 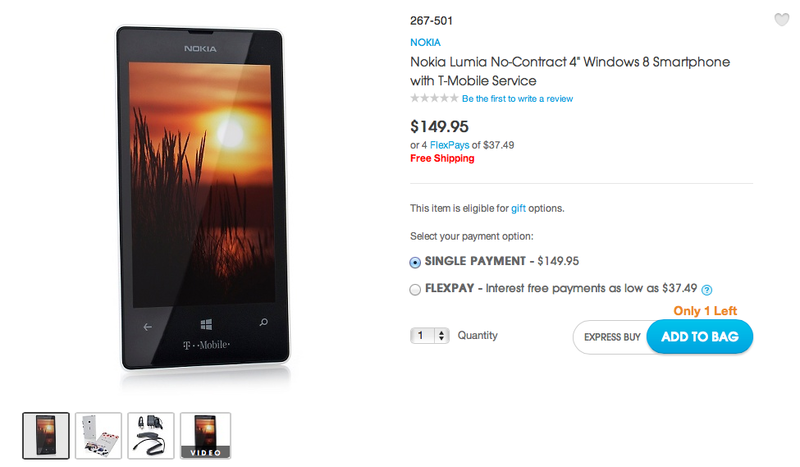 Not a bad deal for a lower spec W8 phone. However, if you want a Jelly Bean android budget one, the LG Optimus L9 is also currently available on HSN for $179.95 (or 4 flex pays of $44.99) and includes a car charger as well. L9 has higher resolution screen and is larger at 4.5″ (vs. 4″) and the L9 camera also has a flash, while the Lumia 521 does not. Both are decent lower priced choices though. I agree. I just purchased the Optimus L9 from Amazon for $190, and it is an awesome phone for the price. Still waiting for the JB update; even though T-mobile announced the JB update earlier this week, it is not yet available. 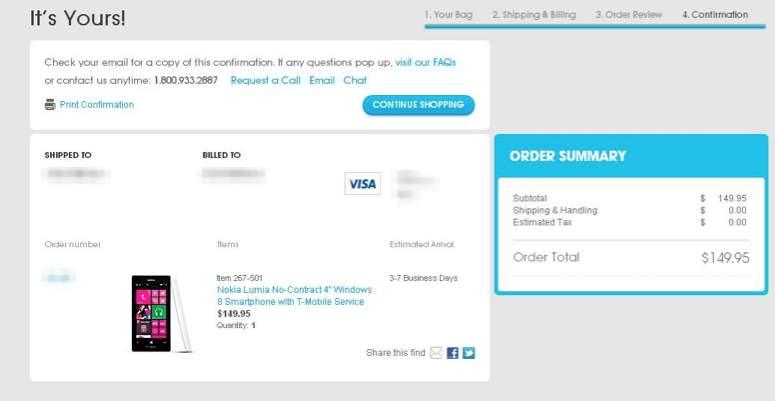 Strange that the only new Windows phone on T-Mobile’s web site will be Lumia 521 … If T-Mobile is no longer going to carry high-end Windows phones like the HTC Windows Phone 8X, it appears T-Mobile might eventually abandon Windows altogether. I thought I was the only one still waiting on my update too lol. I promise you low end androids will not be as smooth and reliable as low end wp8. That’s the big difference to me. Also, you will be able to purchase different color shells for the 521 if you want to customize without adding bulk. Finally, nokias support is pretty awesome. I got one today from HSN as a back-up. Excited to have something decent to fall back on if my One goes bye bye before its time. Anyone who thinks this phone needs a flash has never used a Lumia. I have the 900 and 920 and flash actually distorts and darkens photos. But you’d agree that the camera on the 521 and the 920 aren’t the same quality, right, so perhaps this version does need a flash? I hear ya & in some cases of course that’s true. But still in really low light it’s needed. At least for me there to dark otherwise. That’s just something that’s become a must for me when I choose a device. This is really the best deal!!! They are SOLD out now. Is it locked to T-Mo? 620 seems like a slightly better device, and can be had for 220ish. If 521 was unlocked, it’d make a perfect backup device, as well as prepaid experiment with T-Mo. I just HATE that ugly t-mo logo, can’t they change that silly, old looking T… Now that they merged with Metro, they should come up with an “image” update. That logo is hideous, and they stuck it right on the front of the device. What a shame. when will it be avil @ T-mobile Stores??? So it’s not sold out at HSN – still available. I ordered one but it won’t be delivered until 5-13-13. My main question is the plan. They said it’s unlimited talk, text AND date for $50/month. I thought with the new plans that was $70/month? That’s what I’m paying on my other phone with TMO. Did HSN get some kinda special rate plan? I believe it is unlimited data, however, the first 500mb is at 4G speess, then unlimited at 2G EDGE. Does anyone have a shipping date? Mine still says “packaging” at HSN.